Money in the Garage: Take the stuff off the shelves...it's time to sell! Take the stuff off the shelves...it's time to sell! Happy Thanksgiving...wait a minute, I really mean Merry Christmas! Even though the leaves are still on the trees and Thanksgiving is in a few weeks, it's the holiday season for us eBay sellers. Just like those retail giants Wal-Mart and Target, you can also make your big money during the holidays. I am starting too pull out stuff to sell that I stockpiled during the year. In particular, I like to sell things like clothes with original tags attached and just about anything sealed in the original box. Some of my inventory includes Department 56 village pieces, Thomas the Tank engine toys, American Girl and all those special edition Barbies. Selling during the holidays almost guarantees your stuff will go for higher prices. The Thomas the Tank engine piece seen here is a good example. It's the "Sodor Hospital" and came with Harold the helicopter and an ambulance. I bought this for a dollar way back in the spring. Rather then store it away until the holiday shopping season however, I made the mistake of selling it right away. It turned out to be a dumb move on my part...it only sold for ten bucks! Now fast forward to present time where there are more buyers looking to buy Christmas gifts. The same Sodor Hospital just sold on eBay for $41 dollars! So waiting until the holidays would have netted me another 30 dollars in profit! Oh well, live and learn right? The holiday selling season is "magical" in another way too. You can sell stuff that you just could not give away during the rest of the year! 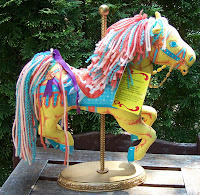 The plush carousal pony seen here is a good example. 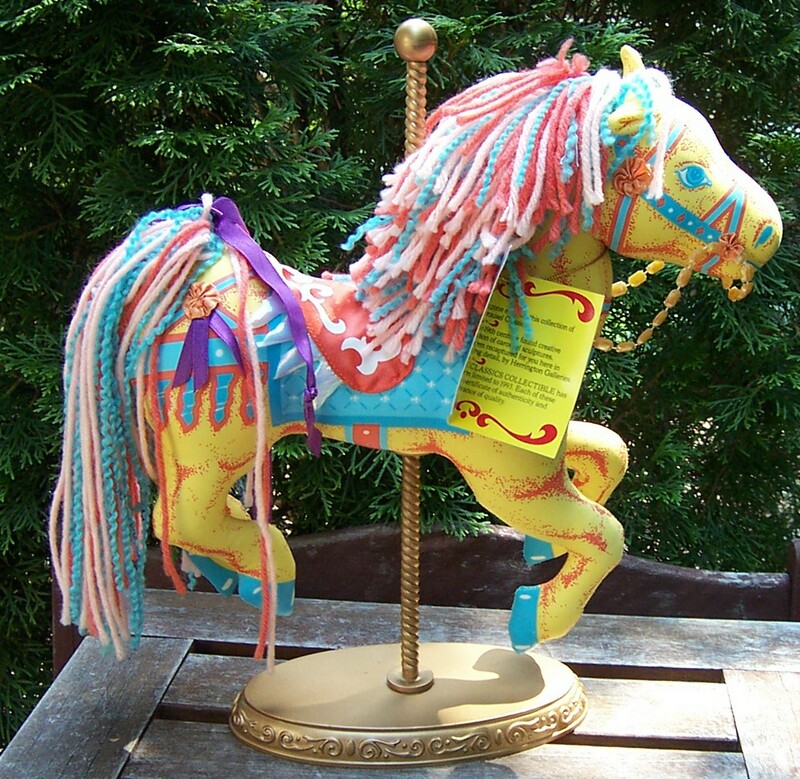 I posted this poor little pony on eBay on multiple occasions during the year without a single bid. She was almost destined for my own garage sale or Goodwill, when I re-posted her one last time during Christmas season. Good thing I did too... she ended up selling for twenty dollars! My pony proves you can really clean up your inventory during the holiday selling season! What kind of things you do like to sell during the holiday season? Like my pony, have you ever unloaded stuff that was impossible to sell during the year? Leave a comment below then start selling! I've been selling on Ebay since July so, I'm still learning the ropes. Lately, I've been doing BIN w/Free Shipping due some things I sold at Auction that went way below what I could have sold it for. Do you do the BIN option or do you do auction style or both? Your thoughts would be greatly appreciated! Hey k...I use to be all auctions-all the time, but I am doing more and more BINs now. Ebay has progressively encouraged buyers to think BIN over auction, so that format has taken over. But I like a good auction because the marketplace sets the price. But here is what I've come to learn-if your item is any kind of hard-to-find collectible, you should go auction. It doesn't have to be an antique, just something that is difficult for a buyer to find at a store. Hopefully, because it's not easy to find, buyers will bid against each other and drive the price up. On the other hand, if your item is something that can be found at most retail stores, say clothing, houseware or a toy, you may be better off going BIN. Just research what others are selling the item for on eBay them match their price. So that's my rule of thumb, if anyone else has some helpful hints please add them below! GSA- I am really glad my last blog helped you out. We're all in this biz together and if I can help you make a few more bucks, that's what it's all about! This is definitely the time of year to start selling off all your Thomas/Brio train stuff. Once the holidays are over very few parents are looking to buy additional trains. I am starting to sell my trains too, although it sounds like you have even more then I do! I like to group the trains in sets of about five. For example, I'll do a group with a red caboose, a Thomas, James, Harold, ect. I think Moms like to buy them them, all those little trains can make great stocking stuffers! The exception would be if you have a rare train or one still in the package. Those I would sell separately. Buildings can always go solo too, like the Sodor hospital.